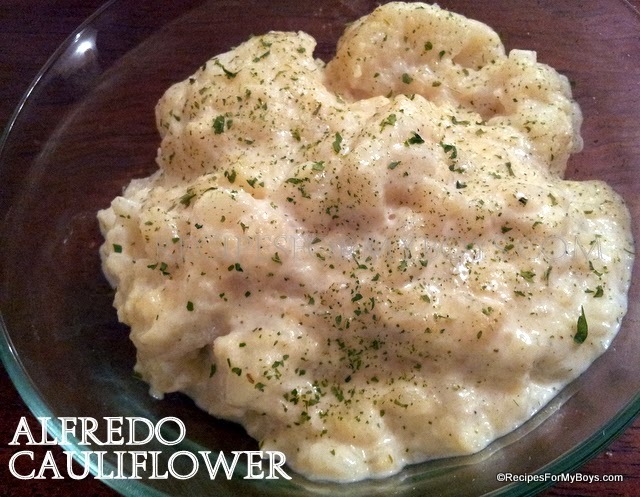 Have you tried Alfredo Sauce on cauliflower? If you haven't, you really need to do so. It is wonderful! The sauce is easily made while the cauliflower cooks. Broken apart in pieces, or mashed, this could easily be a new comfort dish! If you are in a hurry, you can skip making the delicious alfredo sauce and use a jar of store bought sauce. Remove leaves from cauliflower and place in 1 to 2" deep boiling salted water in large pot. Cook 5 to 15 minutes, depending how tender you like it. While cauliflower is cooking, in a non-stick skillet, melt margarine and neufchatel cheese. Add garlic and cook 2 to 3 minutes. Whisk in parmesan cheese and 1 cup milk or heavy cream. Break apart or mash, cauliflower. Top with alfredo sauce. Enjoy!